Burdensome customs requirements disproportionately impact small and medium-sized enterprises (SMEs) which often lack the means and capacity to comply with complex rules. The Trade Facilitation Agreement is an opportunity for these businesses to access international markets at lower cost and greater speed, and thereby significantly grow and internationalise their businesses. SMEs will benefit most from the agreement if they have a sound understanding of the new rules, and play an active part in shaping the reforms that are made by national governments. 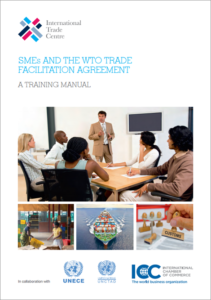 This manual is designed to help SMEs understand the terms, potential benefits and practical uses of each of the technical measures of the agreement, as well as highlight how SMEs can become trusted partners of national governments in implementing and monitoring trade facilitation reforms. The manual also contains practical exercises to test levels of understanding.